My thoughts on the real identity of Jack The Ripper and America's first documented serial killer, H. H. Holmes. Could they be one and the same? I have been very interested in Jack The Ripper from a young age, as my mother has always been so as well. But even after reading countless books and watching numerous movies and documentaries I still didn’t have an opinion on who he was. I knew plenty of people I didn’t think he was, including the most popular choice Sir William Gull. However last year I would watch a documentary that would finally change that, once and for all. Let me divert a moment from who I think he was, to why I believe it was not Sir William. William was 70 years old at the time of the murders, which may not be considered very old now, but people didn’t age as well then as they do now. Even if we are to ignore his age, as it was possible for him to be quite fit at that age, he had suffered the first of several strokes a year before the murders in 1887. He understood the risks to his health after that, stating “One arrow had missed its mark, but there are more in the quiver”. Over the next couple of years (during the time of the murders) he would suffer several more. The final and fatal stroke would come in January 1890. So are we really to believe this 70-71-year-old man who had just had a bad stroke and was continuing to have them, was the brutal Jack The Ripper? In fact I don’t think it is fair to sully the name of a man who gave so much to the medical world, including research into Anorexia (The term anorexia nervosa was first coined by Sir William Gull in 1873), just because it makes for a good story. The man I propose for the Ripper is a man so cold and calculating he would even build a large hotel, just to lure people to and kill them. A man later known as The Devil of the White City. The man’s name was Herman Webster Mudgett, better known as Dr. H. H. Holmes. 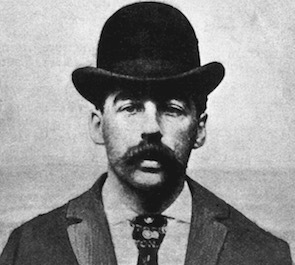 H. H. Holmes is credited as America's first documented serial killer. He confessed to 27 killings with 9 confirmed, but the count maybe as high as 200. It is believed that his fascination with death began when some school bullies made him look at and touch a skeleton, however, this seemed to backfire and instead of fearing it, he became fascinated by it. In 1882, he enrolled as a student at the University of Michigan's Department of Medicine and Surgery, some speculate just so he could learn to kill. While there he stole bodies and made them look like they had died accidentally so their insurance money could be collected. It was after moving to Chicago to pursue a career in pharmaceuticals that he would start going under the name of H. H. Holmes, so he could conduct in various “shady” businesses including in real estate. He married three times, all without ever getting a divorce and while married to these three women he would also have an affair with the wife of a former employee, who would later become one of his victims, irrelevant to the story of Jack The Ripper but worth noting to demonstrate the type of person he was. Holmes built a block-long, three story high hotel in Chicago that the locals called The Castle (officially the World's Fair Hotel), but would later be known as The Murder Castle. The hotel contained many features including windowless rooms, oddly angled hallways and stairs that lead nowhere. Holmes made sure that the builders kept changing so no-one but him completely knew the layout of the building. This allowed him to have a secret chute that led to the basement for disposing of the bodies and gas lines in some of the rooms to poison his guests with. He owned two furnaces for burning the bodies with, as well as pits of acid. In 1894 Holmes was very briefly arrested for a horse swindle, whilst in a cell he told his cellmate (a convicted train robber) of his plan to fake his own death for the insurance money and promised his cellmate $500 for information on a trustworthy lawyer. When later Holmes would kill a man to claim it was himself for the insurance money, his old cellmate (who he hadn’t paid) went to the police, which would lead to his downfall. So why do I believe he was the real Jack the Ripper? In all my reading and watching I hadn’t come across another suspect that seemed quite right, none truly fitted the bill of a serial killer. You might say, none were “worthy” of the title, Jack The Ripper. That was until I came across Dr. H. H. Holmes, perhaps the most intelligent and determined serial killer the world has ever known. But he was American right? So, what evidence was there for him being Jack? It is unknown for sure if he was in London at the time of the killings, however during that time he disappears and can not be located in the United States, yet he reappears in Chicago after they stop. He of course fits the physical profile, he very much looks like what we think of as the image of The Ripper. But of course this is only circumstantial evidence, is there anything more concrete? Yes, in fact, there is. A few years ago Dr. Holmes’s handwriting was compared to the infamous letters of Jack The Ripper by handwriting experts, including one which was recommended by the British Library. One of these experts used a piece of computer software owned by the U.S. Department of Justice, the program concluded that the handwriting (on the Dear Boss letter) had a 97.95% match. This only proves that he wrote the letters and there were many fakes at the time and since, this isn’t proof positive that he was The Ripper. But a handful of letters is believed to be that of the real killer and so if the letters are from the killer and they were written by Holmes then that only leaves one possibility. I was born with the devil in me. I could not help the fact that I was a murderer, no more than a poet can help the inspiration to sing...I was born with the Evil One standing as my sponsor beside the bed where I was ushered into the world, and he has been with me since.